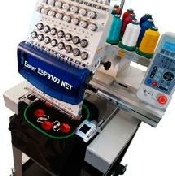 Welcome to CPW Services Inc. My company has specialized in Embroider Machine repairs, training and consulting since 1997. With over 24 years of experience in the Embroidery industry. I understand your needs and requirements for reliable machine operation with minimal downtime interruptions to production. Maximum machine uptime and reduction of costly production stoppages can be achieved with professional maintenance programs, servicing, fault finding and repair work. CPW Services is in a position to supply these services at the highest possible industry standards but at realistic and reasonable prices. Located in the Chicago area, I am able to provide these services all across the Midwest region. I understand that production is not a Monday thru Friday operation. I can provide a weekend/ holiday service and can be on call 24/7. There will be No Extra Charges for Pre-scheduled weekend and holiday services. Barudan, Brother, Meistergram, Melco, SWF, Tajima and Toyota.